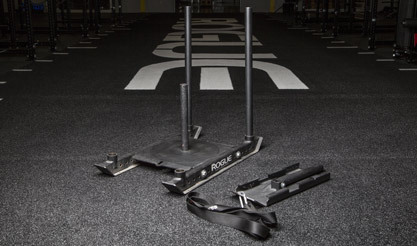 The Rogue Slice Sled is a dual-capability push/pull weight sled that combines quality steel construction and durability with fold-flat, stackable storage. The Slice Sled is Rogue’s first steel speed sled with dual push/drag capability AND a convenient fold-down weight post. The unit comes standard with two 40” upright push handles—the same as found on our popular Dog Sled and E Sleds. With a laser-cut hole, sled strap, and carabiner also included, the Slice Sled has few rivals for versatility, and makes a great option for gyms serving multiple athletes of varying skill levels. Each sled weighs 65 LBS unloaded, and includes a 14” bolt-on center post with a load capacity of well over 300 LBS depending on the types of plates used. Customers also have the option to add a set of 1/2" thick UHMW plastic skis to their order. When bolted to the underside of the Slice Sled, these skis can greatly reduce the risk of damage to your gym flooring when using the sled indoors. The hybrid design of the Slice Sled erases the notion that portable, storage-friendly sleds limit an athlete’s training options. With a set of uprights and a laser-cut hole for a carabiner and sled strap (included standard with order), this unit is ready-on-delivery for both pushing and dragging exercises on a wide range of surfaces. 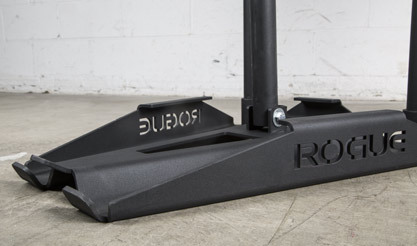 We have utilized the same convenient fold-down weight post from our Fat Boy and E Sleds to create the first Rogue push/pull sled built for stackable storage. Trainers and coaches regularly transporting or storing multiple sleds will particularly benefit from this innovation. 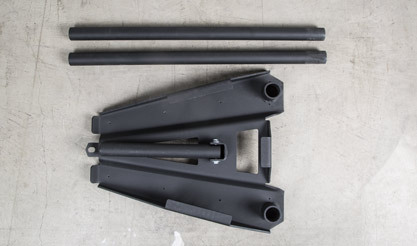 The 14” weight post bolts on to the sled’s base and has a load capacity topping 300 LBS, depending on the type of plates used. Manufactured in Columbus, Ohio, the Slice Sled is constructed from laser-cut and formed 1/4” thick plate steel with our trademark texture black powdercoat finish. This solid one-piece construction gives it a unique combination of durability and compactness, with a total footprint of just 27.5” x 22.75”. 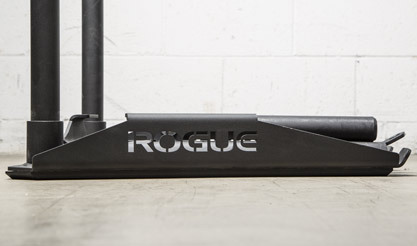 The Slice Sled functions as a hybrid of several of our existing weight sleds, and as a result, can complement a gym’s existing sleds or serve as introduction to the Rogue series. 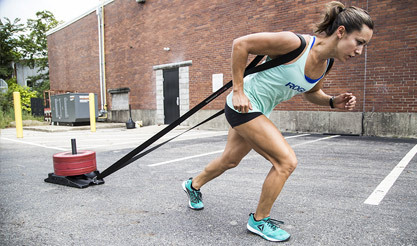 Similar products include the Dog Sled, which offers push/pull capability with the addition of multiple attachments for a more diverse training regimen. The S-35 “E” Sled, meanwhile, is a good dragging option with even greater portability. Customers have the option to add a set of 1/2" thick UHMW plastic skis to their order. When bolted to the underside of the Slice Sled, these skis can greatly reduce the risk of damage to your gym flooring when using the sled indoors. 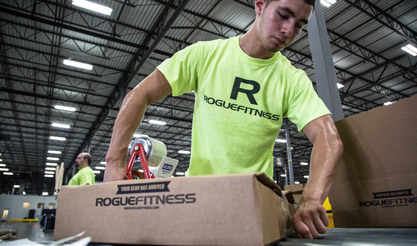 Rogue prides itself on fast, professional shipping, often with same-day turnaround times. Your Slice Sled ships efficiently via UPS ground with some minimal assembly required. You can follow the progress of your order from our factory floor to your door using the online Rogue Shipping Tracker. Rogue Slice Sled is rated 4.5 out of 5 by 27. Rated 5 out of 5 by D123 from Texas Slice Great workout addition! Bottom skids work well on the street. Highly recommend it. Rated 5 out of 5 by Stev0 from works perfectly. plastic skis lasted well over a year and a half, pushing once a week about 6 - 8 x 150 foot pushes (I replaced before they really needed it). No, the thing doesn't dig into the concrete (that would be user error), yes it can be pushed on concrete. Great conditioning tool, if you know, you know. Rated 5 out of 5 by Dannomon from Perfect sled for small gyms This sled is everything you'll think it would be looking at the pictures and description. Perfect for gyms with space constraints. Previous comments about the sled catching while pushing are accurate but it's really not bad on pavement with the plastic skis installed (which makes it a lot quieter when I'm using it in the neighborhood :-). Got set up with Spud sled gear and I'm in sled heaven. Rated 3 out of 5 by Heather511 from Great for pulling, won’t push I bought this sled about a month ago and was super disappointed that I was unable to push it on the street where I workout. It digs in if you try to push it and just STICKS. Luckily, if you pull it the straps pull up on the nose and keep it from digging in, so it’s not a total loss. It’s nice and compact, but if I could go back I’d just spend the extra money on one of the bigger ones so I could use it however I want to. Rated 3 out of 5 by Justin B from Not for grass I got this out the other day since it had been a while. I remembered why. Even pushing on the handles as low as possible and it still digs into the dirt if there is the slightest bump in the lawn. I wish the front had a higher lip so it would slide across the lawn rather than slice into the ground. Rated 5 out of 5 by jkmccloud from As promised This sled gets the job done of larger sleds, with a smaller footprint. I hang mine on the wall and store the posts in the vertical bar stand, great addition. Rated 4 out of 5 by Citrusfarmer from Great Conceptual Sled, Minimal Inherent Flaws Unbeatable, bulletproof equipment. Rock-solid construction that will outlive me. I opted for the plastic skid accessory kit and I’m glad that I did. I tried the sled on my gym floor (faux grass carpet) and it was difficult to push without the sled wanting to dig in at the nose end. Even changing to a lower push position along the uprights had little effect on correcting the issue when attempting an aggressive take-off. So, I put the plastic skids on and it helped out a lot. Unfortunately, the inherent flaw is the fact that the base footprint of the sled is just too short to altogether avoid the “digging-in” effect without compensating the approach to pushing the sled. Overall, I’m pleased with the equipment. If space is not at an absolute premium, I would opt for a longer sled (perhaps the Dog Sled) in order to get a more stable pushing base.